Released in September 2018, Ohio’s 2017 abortion report is available on the Ohio Department of Health website. The report shows that total abortions in the state increased slightly from 2016, while chemical abortions, and complications resulting from them, rose significantly. Abortions reported in Ohio increased by one percent from 20,672 in 2016 to 20,893 in 2017 (Fig. 1). Some of this increase was likely attributable to chemical abortions – chemically induced abortions increased by 40 percent over the same time period. There were 5,345 chemical abortions reported in Ohio in 2017. Since 2001, the first year after the Food and Drug Administration approved the use of the abortion drug mifepristone, chemical abortions in Ohio have risen by almost 400 percent. Despite this increase in chemical abortions the overall number of abortions is decreasing. Reported abortions in Ohio have fallen by 50 percent from 1991, the earliest year of data posted on the health department website. 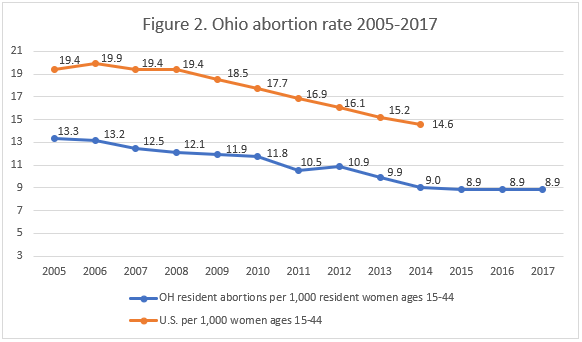 Ohio’s resident abortion rate did not change from 2016 to 2017, holding steady at 8.9 abortions per 1,000 women between the ages of 15 and 44 (Fig. 2). Ninety-four percent of the abortions reported in Ohio were performed on state residents, and six percent were performed on non-residents. A majority of abortions (60 percent) were performed on women in their twenties, while 27 percent were in their thirties, 10 percent were under the age of 20, and just three percent age 40 or older. White women made up the largest racial group, undergoing 48 percent of the abortions reported in Ohio. Forty percent of the women were black, and four percent were Asian or Pacific Islander; nine percent were of a different or unknown race. African American women were much more likely to undergo abortions than were white women – CLI estimates that the black abortion rate was 24 abortions per 1,000 women of childbearing age, while the white abortion rate was less than five abortions per 1,000 women of childbearing age. Most of the abortions reported in Ohio were performed on women who had completed high school. Thirty-six percent reported high school as their highest level of education, 25 percent had attended some college, and 21 percent had an associate degree or higher. Thirteen percent had less than a high school education, and six percent did not report their level of education. Thirteen percent of the abortions reported in Ohio were performed on women who were married or separated, 77 percent were performed on unmarried women, and marital status was not reported for nine percent. Most of the women getting abortions had other children. A quarter of Ohio abortions were performed on women with one living child, and 37 percent were performed on women with two or more children, while 36 percent had no living children. More than half of the women – 59 percent – had never had an abortion before, and 41 percent of the abortions were repeat abortions. Twenty-five percent had one previous abortion, and 16 percent had two or more. A little over half of Ohio abortions occurred early in pregnancy. Fifty-six percent were performed earlier than nine weeks of gestation, and 29 percent occurred between nine and 12 weeks. Twelve percent were performed between 13 and 18 weeks and two percent between 19 and 20 weeks of gestation. Ninety abortions were performed after 20 weeks of pregnancy, including one abortion performed after 24 weeks, when many babies are capable of surviving outside the womb. Ohio prohibits abortion after 20 weeks post-fertilization (approximately 22 weeks of gestation) unless the mother’s life is at risk or there is “a serious risk of the substantial and irreversible impairment of a major bodily function.” In 2017, gestational age was determined before every abortion; ultrasound was the most common method, used in conjunction with 92 percent of abortions. For abortions performed after 19 weeks of gestation, Ohio requires abortion doctors to sign a statement of their professional judgement regarding the “viability” of the baby about to be aborted. According to abortion doctor attestation, there were 453 “nonviable” babies and one “viable” baby aborted after 19 weeks in Ohio. Ultrasounds were used to estimate the gestational age for all but one of these babies, but no consideration was noted as to the known intrinsic error of +/- 3 weeks at gestational ages in the late second trimester. Additional methods of determining gestational age were weight measurements and amniocentesis. Ohio’s abortion report contains information from two different sources on abortion complications.1 Some complications are reported to the state health department by the abortion centers on the abortion reporting form. Additional complications are reported on a separate complication reporting form by health providers who treat women for abortion complications. Ohio’s annual abortion report presents data from these two sources in two separate tables. In Ohio, every physician who treats a woman for an abortion complication is required to report it to the Ohio Health Department; however, the low complication rate suggests that some complications are going unreported or not being identified as related to abortion. In 2017, there were a total of 178 reported complications from abortion, 26 immediate and 152 recognized after discharge from the clinic. There were 26 reports of abortions with immediate complications – for a total of 30 reported complications – that were identified in abortion centers at the time of the abortion and reported on abortion reporting forms. Multiple complications can be reported from a single abortion procedure. The most common types were incomplete abortion – when pieces of the baby or placenta are left in the uterus – and hemorrhage, each occurring seven times. There were four cases of hematometra, three uterine perforations, two failed abortions (when the baby survives the abortion), one cervical laceration, and one problem related to anesthesia. The remaining five complications were ureteral injury, uterine rupture, two instances of diagnosis and observation, and one unspecified complication. There were 152 abortions that caused complications that were treated after the woman left the clinic and reported on the complication form, for a total of 162 reported complications. Failed abortion occurred 57 times, and there were 56 incomplete abortions. There were 25 cases of hematometra, 14 hemorrhages, seven infections, and one perforated uterus. Two other, unspecified complications were also reported. Eighty-six of the abortions causing complications occurred at eight weeks of gestation or earlier. Fifty-five were performed between nine and 12 weeks, and seven were performed between 13 and 19 weeks. One abortion performed after 20 weeks of gestation was reported to have caused a complication. Three complications occurred at unknown gestational ages. The vast majority of reported abortions, 99 percent, took place in ambulatory surgical facilities, although the report does not indicate whether these facilities were licensed or unlicensed. There were 102 abortions performed in hospitals and 81 in non-surgical clinics. Sixty percent of the women getting abortions reported using no contraception at the time they became pregnant. Twenty-one percent reported using some type of contraception, and 19 percent did not answer the question. The most commonly-used method was oral contraception, used by eight percent of the women undergoing abortions. Ohio’s abortion report does not include information on Ohio’s informed consent process, although Ohio law requires that each woman be informed of the details of the abortion procedure she will undergo, the characteristics of her unborn child, and the alternatives to abortion available to her. However, the abortion report provides information on the type of additional counseling, if any, given to women getting abortions. Each woman could receive more than one type. Sixty-nine percent were given medical counseling, and 12 percent received counseling from social services. Thirty-eight women received psychological counseling, 36 obtained pastoral counseling, and 15 were given some other type. Thirty-one percent of the women getting abortions received no counseling. The report does not provide any details about what the counseling entailed. The number of chemical abortions reported in Ohio has skyrocketed over the past few years, while surgical abortions have gone down. In 2004, Ohio passed a law requiring abortion providers to abide by Food and Drug Administration (FDA) protocols when dispensing the abortion drug mifepristone. However, the law was blocked by a court decision and did not go into effect until 2011. Under the new law, abortion doctors were required to follow safeguards created by the FDA that necessitated multiple trips to the abortion clinic and a longer process before the chemical abortion was complete. Ohio saw a massive 79 percent drop in chemical abortions that year. In 2012, Ohio issued an updated abortion reporting form and began collecting more detailed information on the types of drugs used to perform chemical abortions. Ohio’s reports show an increase in abortions performed with mifepristone, while abortions performed with the cheaper and even more dangerous drug methotrexate have declined. In 2016 the FDA updated the mifepristone protocols changing the way the drug is administered and speeding up the process of obtaining a chemical abortion. 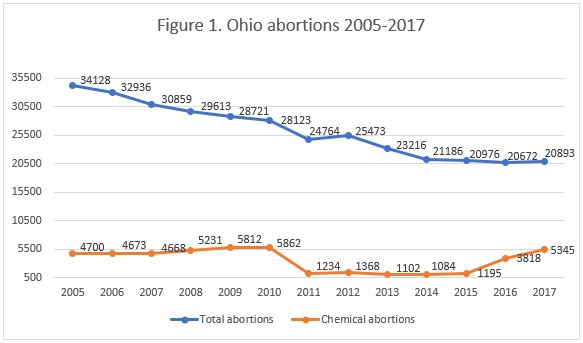 Since 2016, chemical abortion totals have continued to climb in Ohio. Complications have been climbing as well. In addition to the general requirements to report abortion complications to the Ohio Department of Health, Ohio requires doctors who administer Mifeprex to submit adverse event reports to the state medical board whenever women experience a complication due to the abortion drug. According to documents provided to CLI by the Ohio medical board, 105 of the chemical abortions performed in 2017 caused adverse events – up from 59 the year before. Even considering the sharp increase, it is likely that not all adverse events were reported to the medical board. More than three percent of women undergoing chemical abortions end up in the emergency room, but only two percent of the chemical abortions performed in Ohio in 2017 resulted in reported adverse events, and many of the adverse events were resolved in the abortion center, not an emergency room. It is possible that some adverse events are not being reported. One study of chemical abortion complications based on self-reporting by abortion providers found significantly lower complication rates than other studies based on independent review of patient medical records. This study raises concerns that abortion providers may be significantly under-aware of complications from their own procedures. Thus self-reported complication data may vastly underestimate true complications. Another serious obstacle to accurate data collection may be that women are failing to disclose to medical personnel that they are suffering a complication of a chemical abortion, as some abortion advocates have recommended. Launching an information campaign to ensure that ER physicians and ob-gyns as well as hospital administrators are aware of the reporting requirements for abortion complications and making non-reporting accountable with financial penalties. Currently, Ohio is defending some of its pro-life laws in cases that could end up at the Supreme Court, and the Ohio legislature recently passed a bill prohibiting abortions after the baby’s heartbeat can be detected, making accurate, detailed abortion statistics especially relevant.